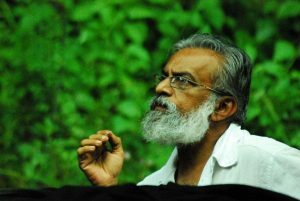 After penning some notable scripts for films like Ulladakkam, Pavithram and Uncle Bun, P Balachandran has started calling the shots for the movie ‘Ivan Megharoopan’ based on the life of poet P Kunjiraman Nair. The movie which will be realistically showing the various seasons of the country sides, will be shot in four different seasons in four schedules. As per the plans, P Balachandran has completed the first schedule of the movie at Ottappalam and is waiting for the next to happen in a couple of months time. While Prakash Bare is the hero, Padmapriya plays the heroine of the movie. Rajeev Thampi handles the camera of this movie which will also feature songs by O N V Kurup- Sharath team. ‘Ivan Megharoopan’ is produced by Silicon Media.